Gametime Forecast: Mid-60s, 60% chance of rain in the AM. Then clearing. Parking/traffic issues. With Stadium Blvd shut down at the State St. bridge all season, that will snarl traffic. AA.com has a handy map. Rain is also in the Saturday AM forecast, which could close the golf course and/or Pioneer. Plan accordingly. 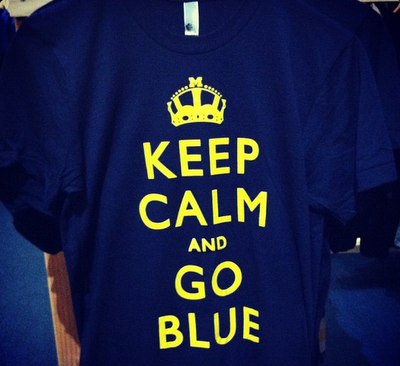 This is the t-shirt that Michigan fans deserve. Via UGP. Get yours today! FFFF from MGoAce. MVictors on Oosterbaan, Banners and Books. MZone's Know Your Foe. Previews from Maize n Brew, Big House Blog, BWS, Hoke's Mad Magicians, WLA, UMGoBlog. Tremendous breaks down the AF offense. 5 Keys from MLive's Kyle Meinke. Air Force is well known for their triple-option offense which operates out of an I-form and the flexbone. Don't be surprised to see AF spread the ball around a lot on the ground. Through the air is another story. See below. Defensively? That's where Ace helps me out. 3-4. Sometimes an outside linebacker will play with his hand down, but for the most part the Falcons run a basic 3-4. Translation? We're the Mountain West Conference, what's a defense? Al Borges addressed the play-calling against Alabama by telling the media he wouldn't change anything for Air Force. Much to the chagrin of many Michigan pundits, I think this is the right call. Alabama was a whole different beast when it comes to how we match up. Borges has shown that he can make this offense tick. What happened last week was actually not all that bad once you consider how well more experienced and established offenses have done against the Tide recently. Fitzgerald Toussaint will return to the lineup, although it's not clear if he will start. Either way, he will see the bulk of the touches as Michigan tries to rejuvenate it's running game. That said, I still expect to see guys like Rawls, Smith and Hopkins in there at times. Yesterday in the stats breakdown, we talked about Gardner being used primarily as a receiver now. This is mainly for two reasons. 1: He's actually a pretty darn good receiver. 2: Michigan is desperately thin there. Gardner is capable, but still very raw at things like route running and catching. But his athletic ability can't be denied. We'll also find out how much Borges really wants to run Denard. This is the sort of game where Denard could run for 200 yards, if he's allowed to. It would seem as if Borges held Denard back a bit against Alabama. This could have been out of necessity, to keep him from getting injured. Who knows. We'll find out tomorrow. Michigan will also look to establish itself along the line of scrimmage. If you looked at Brian's offensive UFR, you saw that no one along the line had a good game last weekend. I think this is because of Alabama, but even guys like Lewan had issues. Watch out for Schofield at RT, he needs to redeem himself. If Alabama's defense was a horrible matchup for the Michigan offense, Air Force is just the opposite. They're small and relatively inexperienced. Last year they ranked woefully low in rushing defense (109th nationally) but was 6th overall against the pass. But that was last year. 2012 brings a new coordinator and mostly new personnel. They do bring back a few guys along the line, which will help, but the defense as a whole is a huge liability. Like you would expect with most MWC teams, defense is really more of an after-thought. Air Force's triple-option is really a unique system. Many years ago, a lot of college teams ran it, but these days only Air Force and maybe the service academies run this system. But just because it's waned in popularity doesn't diminish it's effectiveness. You could argue that because of it's rarity, it's harder to stop because it's harder to gameplan for. And if a team is genuinely great at running this style, it can be a huge advantage against even the most stout and disciplined defenses. AF will run this triple-option, a lot. They tallied 484 rushing yards last week against FCS foe Idaho State. They are a run first, run second and maybe pass third offense. I'm looking at Michigan's LBs to show up this week after getting trounced a week ago. Against a triple-option, this really is the matchup to watch as far as I'm concerned. I fully expect Air Force to gain uncomfortable amounts of rushing yards tomorrow. This video should help you lose some sleep tonight. If there's a bright spot for Michigan here it's that AF is pretty inexperienced on offense, and the option thrives on consistency. QB Conner Dietz is a senior, but also a first-year starter. His primary running back is Cody Getz, who tallied 218 yards rushing last week and 3 touchdowns. Dietz added 74 yards and 1 touchdown of his own. The primary goal of Michigan's defense should be to get AF to pass. That's where Michigan's biggest advantage lies. Even with the loss of Blake Countess last week, Michigan is still pretty experienced in the defensive backfield. Air Force did not return a punt last week. I'm not sure why. Idaho State punted 4 times. But Anthony Lacoste and Dontae Strickland handle primary return duties on kickoffs. I suspect one of them would handle punt returns as well. Parker Harrington handles placekicking duties and is a returning starter from 2011. David Baska averaged 42.5 yards per punt last week. For Michigan, Dennis Norfleet was one of the few standouts from the Alabama game. The redshirt freshman looks very natural returning kicks...almost reminds me of Steve Breaston. He has a burst that most don't have, like Darryl Stonum bust faster. He will break one this season. I thought Hagerup was outstanding punting the ball last week. He did out-kick his coverage a couple of times, but he looked about as consistent as he ever has. Matt Wile bombed kickoffs out of the endzone, which all you can really ask for from a kicker. Brendan Gibbons didn't attempt any field goals last week...but looked fine on his two PATs. • Denard is finding receivers in blue jerseys. • Fitz is in end-of-2011 form. • Special teams (Norfleet) score a touchdown. • Air Force's triple-option is getting the edge and forcing Michigan to over-pursue. • You see Will Hagerup as much as you did last week. • In the 3rd quarter, you suddenly realize that your lawn needs to be mowed.